Well, I've done it again. 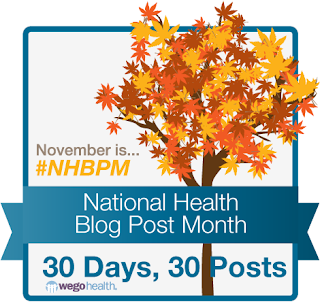 I've signed up for Wego Health's National Health Blog Post Month, and for National Novel Writing Month. Although, to be honest, I'm cheating a bit with NaNoWriMo. I have two projects, neither of which are strictly speaking novels. One is a book about lupus, based on this blog, and the other is a book of prayers and reflections based on my Worship blog. This year, NHPBM has a choice of topics for each day as well, which makes it even easier. So, if I seem to anyone to be going slightly insane, it's because I'm battling with brain fog, headache, and two major writing projects. Today's topic is: Why I write about my health. And being the cheat I am, I'm going to respond to that with the Introduction (first draft) of Big Bad Wolf, my book about lupus. Over the next few days, I became bothered by the idea that I really ought to do something more constructive than that. My first career was in journalism, so writing was an obvious option for that something. So began the blog Sometimes, it is Lupus. I began with the idea of creating awareness about lupus, but over time found that many of the readers were lupus patients, people who didn’t need to be more aware, but to be reminded that they weren’t on their own. For me, as a Christian minister, this showed there was a pastoral need. People were hurting, not just because they had this horrible illness, but also because it’s hard to talk about it. Many people who don’t have lupus, don’t understand what it is like. Some people who are close to lupus patients really want to understand, and do care. Some others choose not to learn, and to simply judge lupies in their lives as “lazy” or “hysterical”. The Sometimes, it is Lupus Facebook and Google+ pages were begun, offering an opportunity for people to interact around the issue of lupus and how it affects our lives. So far the Google+ page has not taken off, but the Facebook page is growing in popularity at a much faster rate than I expected. There really is a need for us to talk, to share our experiences, and to know there is someone else out there who just “gets it”. My hope is that this book will continue the discussion – will help people who really want to know what lupus is like to understand, and will help lupus patients to feel a little less alone. The first time I did NHBPM, there was a topic on what I could do to make a difference to my community. What I came up with was the Business Directory. Lots of people with chronic illnesses find our ability to earn an income is limited by our physical limitations. Many of us have small businesses, often with selling things we do for therapy (jewellery, art work, writing). The Directory is my attempt to bring these businesses together into one listing. 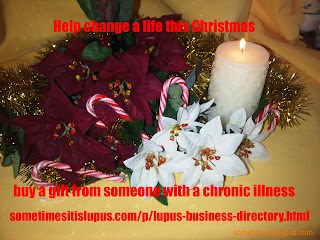 When you buy something from a business in the Directory, you are helping someone with a chronic illness to help themselves. Some of Victoria's Yolo Sol stock. 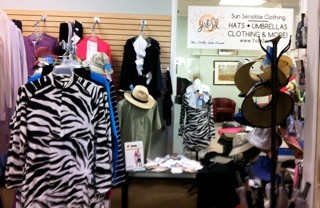 New in the business directory today is Yolo Sol, owned by Victoria Satinsky. Victoria has lupus, and set up her business to deal with a problem most lupies know only too well: how to have maximum sun protection and still be able to dress nicely.